In the days ahead, POS45 will fire Mnuchin, because he can’t fire Powell, and blames everyone else but himself for the lousy, full employment economy. He blames the Democrats for lack of money to “build the wall” when Republicans control the House and Senate. Remember when, on June 16, 2015 he said in part that, “I would build a great wall, and nobody builds walls better than me, believe me, and I’ll build them very inexpensively, I will build a great, great wall on our southern border. And I will have Mexico pay for that wall. Mark my words.”? 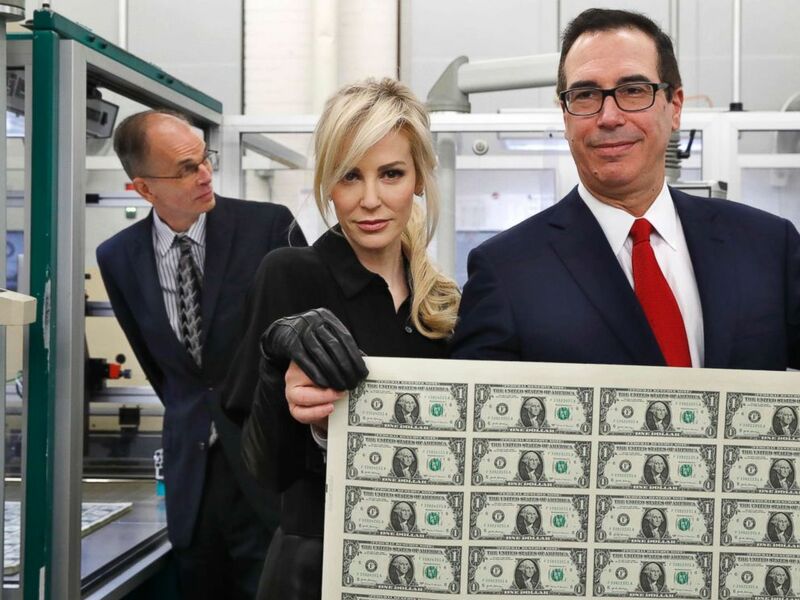 Treasury Secretary Steve Mnuchin & wife Louise Linton hold sheets of money at the Bureau of Engraving and Printing in Washington, D.C., Wednesday, November 14, 2017 showing the first run of bills featuring his signature. And now, The Con Artist in Chief wants American taxpayers to foot the bill. According to his style (as a monkey businessman, he’s accustomed to giving orders which no one questions… which does NOT happen in government – witness the numerous news stories of people who tell him “you can’t do that” to various things he thinks he can simply order to be done), he ought’a just tell Mnuchin to go print some money, put it all on pallets, and send it to Mexico to have their bricklayers “build the wall” and dig the dirt for it from their side. Alternatively, he could start a 501(c)3, get all his rich buddies to donate to it (tax deductions, you know), and then present it as “a gift to the American people.” Problem solved. “The stock market was only open for half a day Monday, and that was more than enough time for the Dow Jones Industrial Average to drop 2.9% to 21,792.20. That was its worst Christmas Eve performance since 1918. “Other U.S. indexes fell too. The Nasdaq lost 2.2% to 6,192.92. The Standard & Poor’s 500 index fell 2.7 percent to 2,351.10. U.S. stocks are on track for their worst year since 2008, which was during the Great Recession, and their worst December since 1931, which was during the Great Depression. “The markets have been dealing with concerns of a slowing global economy, the trade dispute with China and last week’s interest rate increase — the fourth by the Federal Reserve this year. This entry was posted on Tuesday, December 25, 2018 at 2:05 AM	and is filed under - Business... None of yours, - Did they REALLY say that?, - Lost In Space: TOTALLY Discombobulated, - Read 'em and weep: The Daily News. Tagged: business, con artist, economy, Federal Reserve, GOP, idiot, market, money, POS45, Republican, Republicans, Steve Mnuchin, The Wall, trade, treasury, Trump, Wall Street. You can follow any responses to this entry through the RSS 2.0 feed. You can leave a response, or trackback from your own site.